Visiting the local markets is a particular way to dive right into the culture and street life of your holiday destination. If you want to know more of the real Malaga and its people, if you like to discover new flavours and colours the best way is to enjoy the markets in Malaga. There are food markets, where generally can be purchased fresh fruit and vegetables; if a market is permanently installed in a building, such as the famous market Ataranzas in Malaga city, we can find also a wide choice of fish, seafood, meats and cheeses. The installed markets open their doors every weekday and Saturday until around 2 pm. There is also a mobile version of these markets that usually take place once or twice a week in the streets and squares in the different municipalities of Malaga and the Costa del Sol. And since very recently there are also markets for organic fruit and vegetables, which usually take place once a month in different municipalities. Another type of market in Malaga are the flea markets, where are usually sold for little money second hand items and where we can find many rarities and curiosities. The third type of market are the markets where professional vendors sell all kinds of items of accessories, clothing, sunglasses, shoes and much more, which are usually imitations at very affordable prices. One type of booming market are craft markets, where we can enjoy a wide range of handmade products; such markets are preferably installed during the summer when there is a large number of visitors; and quite often they can be found in the Marinas of the coastal municipalities. There are also thematic markets, such as the famous medieval market that takes place every year in the summer months in several municipalities, being the most beautiful the ones of Estepona and Fuengirola at Sohail Castle. Since most of these markets are directly related to immediate needs and traditionally are part of everyday life of the population, they often have a very central location in the municipalities and usually around can be found several bars and terraces to take a coffee or a soda, recovering from shopping or enjoying watching the passers-by. Where are the street markets? When you come to the Costa del Sol to enjoy your vacation, inquire at your local tourist office on the street markets and flea markets, you will surely love them! Morning large street market by Recinto Ferial Las Albarizas. 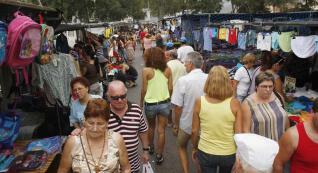 More information about street markets in Marbella. Next to Mercado Municipal "El Calvario"
In the Divina Pastora distric.